Liverpool's owners say they will not damage the club's future with "risky spending" but have pledged their commitment to the club. 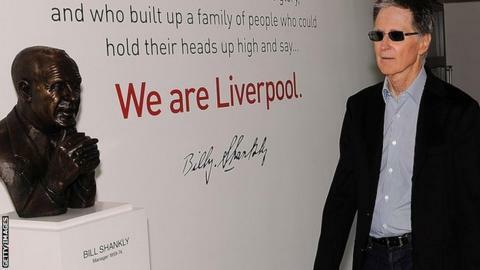 In an open letter to fans, main owner John Henry said: "We will never place this club in the precarious position we found it when we took over at Anfield." Liverpool are without a win in three games in their worst start to a season for 50 years. Henry said he was disappointed at their failure to add a new striker. Liverpool manager Brendan Rodgers has admitted he would not have allowed Andy Carroll to join West Ham had he known he would be unable to strengthen his squad. Rodgers let the England striker leave for Upton Park as he was convinced he would bring in either Fulham's Clint Dempsey or Chelsea's Daniel Sturridge on loan. The Reds boss, who has the option of recalling Carroll from his season-long loan in January, insists he was not misled by the club's American owners, Fenway Sports Group, over transfers. In the letter to fans published on the official club website, Henry said: "I am as disappointed as anyone connected with Liverpool Football Club that we were unable to add further to our strike force in this summer transfer window. "But that was not through any lack of desire or effort on the part of all of those involved. "They pushed hard in the final days of the transfer window on a number of forward targets and it is unfortunate that on this occasion we were unable to conclude acceptable deals to bring those targets in. Sunday's 2-0 home defeat by Arsenal left Liverpool 18th in the Premier League after three matches. Henry and his fellow investors, who took over in October 2010, have said their investment in the club is a long-term venture and he pointed to the agreement of new contracts with players Daniel Agger, Martin Skrtel and Luis Suarez. "No-one should doubt our commitment to the club. In Brendan Rodgers we have a talented young manager and we have valued highly his judgement about the make-up of the squad," he said. "There was widespread sympathy for Rodgers from experienced Anfield observers and FSG's reluctance to stump up for a player their new manager clearly wanted - and hardly one from the top end of the market - does not square with Liverpool chairman Tom Werner's recent claim that he wants the club to compete with Real Madrid and Barcelona." Henry added: "Spending is not merely about buying talent. Our ambitions do not lie in cementing a mid-table place with expensive, short-term quick fixes that will only contribute for a couple of years. "That ethos is to win. We will invest to succeed. But we will not mortgage the future with risky spending." FSG rescued Liverpool from the brink of administration after the club were left with heavy loan payments following the ownership of Tom Hicks and George Gillett. "We are still in the process of reversing the errors of previous regimes. It will not happen overnight," said Henry. "It has been compounded by our own mistakes in a difficult first two years of ownership. It has been a harsh education, but make no mistake, the club is healthier today than when we took over." In the 835-word letter, Henry said the owners' ambition is to win the Premier League, and they were not driven by profit. "After almost two years at Anfield, we are close to having the system we need in place," he said. "The transfer window may not have been perfect but we are not just looking at the next 16 weeks until we can buy again: we are looking at the next 16 years and beyond. These are the first steps in restoring one of the world's great clubs to its proper status. "It will not be easy, it will not be perfect, but there is a clear vision at work."